Communion, also known as the Lord’s Supper, is the sign and seal by which our communion with Christ is renewed. As a congregation, we celebrate communion monthly (usually on the first Sunday), and at special times, such as on Christmas Eve and Maundy Thursday. Communion in the Presbyterian Church is an inclusive event. Our tradition is that all baptized Christians who rejoice in so great a gift, who confess their sins, and who draw near with faith intending to lead a new life, may receive the Lord’s Supper. This includes baptized children who have expressed a desire to participate, and who have been instructed in the meaning of the sacrament in a way they can understand. When we celebrate the Lord’s Supper, the Lord Jesus Christ is truly present, pouring out his Spirit upon us. By his Spirit, the bread that we break and the cup that we bless share in our Lord’s own body and blood. Through them he once offered his life to God; through them he now offers his life to us. 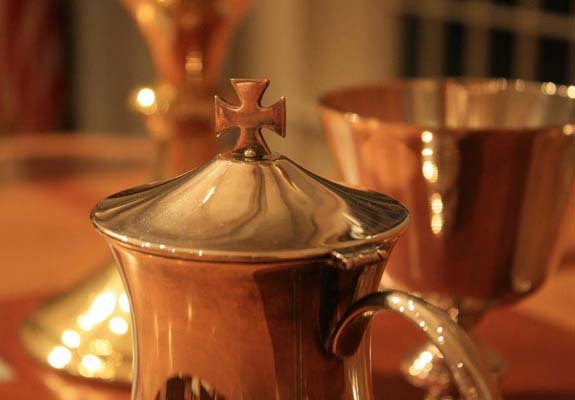 As we receive the bread and the cup, remembering that Christ died even for us, we feed on him in our hearts by faith with thanksgiving, and enter his risen life, so that his life becomes ours, and our lives become his, to all eternity. Communion may also be celebrated as part of pastoral care. Please contact the Pastors if you would like to receive communion or have questions about our sacraments.